Today I took Child number 3 to his first day of kindergarten. As we have been faithfully counting down the days I have had many people ask me how I feel about sending him off to school. My answer has always been, without hesitation, “he is ready, so I am ready.” After all, it wouldn’t be fair for me to be sad about something that he has been so excited about. So why then, when I passed a crying mother on the side walk this morning did I want to yell at her to toughen up! Why did it matter to me if sending her kid to kindergarten made her cry? That’s her problem, not mine. It wasn’t long before I learned why her tears made me so mad. As K10 gripped my hand tightly we made our way through the big front doors of the big school and we found his class. There was a lot going on! I helped him wash his hands at the front door and casually said, “Oh look, your friends are sitting at the table in the back.” Then, without even a glance in my direction and with a gigantic K10 smile on his face he let go of my hand and ran to sit with his friends. I hollered, “Good bye, have fun!” but my voice was lost to the excited boy who had been waiting for this moment for many many months. Quickly I turned my head and rushed out of the class room. By the time I made it to the sidewalk I knew why I was so mad at the crying Kindergarten mom I’d seen on my way in. Deep down I knew, her problem wasn’t hers alone but it was mine too. I have dropped kids off at their first day of school two times before without so much as a moist blink. Sure, with my two big kids I felt excited and nervous for them but I knew they were well prepared and very ready. I also knew that I had other small children waiting for me at home; I wasn’t going to be lonely! So why was this time so different? I don’t think I love child number 3 more than the first two, and I don’t think he is any more or less prepared for school than his brother and sister. I even still have a 3 year old at home to keep me company. But a reality set in that I hadn’t been willing to see before. My kids are growing up, I am getting older, and I will never be able to have them little ever again. For some people this is a great relief, a feeling that they have somehow arrived at the best time and age of life. For me, I cry. When I quit my job 9 years ago I was so worried I would get tired of just being a mom. I didn’t know what I would do with my time; I didn’t know how I would keep my brain busy. Now, looking back I am so amazed at how fast the last 10 years have gone. I remember so well walking around our all but uninhabited neighborhood with J5, picking up rocks, catching caterpillars, and telling stories. Unfortunately child number 4 hasn’t ever had my undivided attention like the first gets but I’ve still tried to be a good mom who takes the time to play. I wish I could say that I have never looked to a future where all the children are at school, the house stays clean and everyone uses the bathroom without assistance but that wouldn’t be true. I have many things I want to do with my life, things that have been on pause for the last decade, things that I thought I was ready to push the play button on. Now I’m not so sure. My kids have brought me more joy and happiness than any job or project could ever bring. I have worked so hard to prepare them for each new stage so they wouldn’t have to be afraid. I am proud of K10 for being so ready, both mentally and emotionally. Normally I would be disappointed in the tears streaming down my face but today I’m going to sit back and let the tears come. 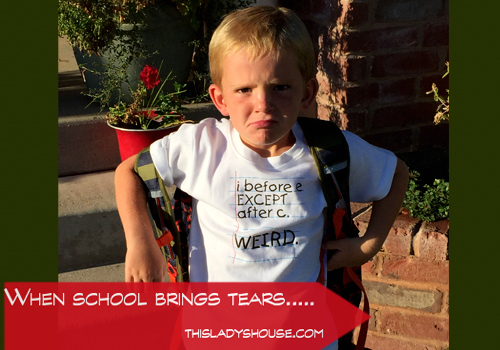 Crying on the first day of kindergarten means I love my children, it means I am proud of their accomplishments, it means I understand the passing of time and the value of being grateful for what I have today. It means I understand that they don’t need me for everything anymore, which means I have accomplished my goal of helping them to be prepared. If I didn’t let them go, I wouldn’t see them grow. And from now on I’ll be a little more understanding of the crying mothers walking out of the kindergarten classroom.